This was completely out of my imagination - originally from a series commissioned by Winn Devon for Limited Edition Prints. These were dreamy seascapes, idyllic aqua waters, tropical fruits and where I would rather be, sitting in a comfy chair, overlooking the water and reading a book. This was for years my favourite painting -it is calming and pretty. The little terracotta Goddess is beautiful and the Calla Lillies are picked from our garden. A tropical feeling Still life with strelitzias picked from our garden. 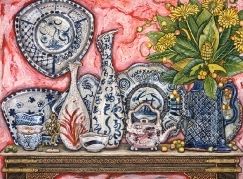 I used to make most of the ceramics in the paintings. Port Melbourne's pretty beach with huts never fails to inspire me whenever I run/walk or bike down there....and I always do every visit. 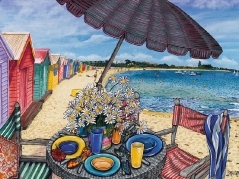 Everyone loves Noosa and it never fails to inspire me to paint. I would love to live there -but so does everyone else who visits -and that's made it more expensive than Sydney. 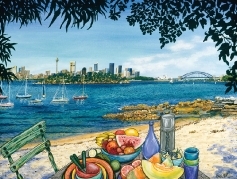 We love Little Cove, the tropical coastline & the National Park just past where I painted this. Vaucluse, Sydney. A hidden secret beach accessed by a bush path or by boat with stunning views and the perfect picnic spot. 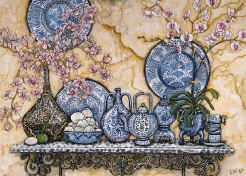 The Blue & White phase lasted quite a while and I went crazy designing and painting all my ceramics, real life and in paintings, in all shades of Blue and White. Older style, simpler patterned ceramics. 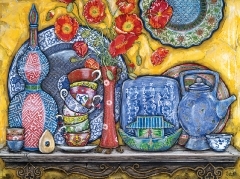 I was in a Still Life phase of painting for many years, arranging, painting & eating my way through a lot of product. This was a commissioned work.